Jilda and I attended a beautiful wedding this evening. It was the daughter of two of our dearest friends. The event was remarkable and brought people together from around the country. After the wedding service was a mixer while the food was being prepared. There were probably 350 people standing, sipping champagne and laughing. Jilda and I both met a lot of new people and the common question was: how do you fit into the picture? The stories about how people are connected were simply amazing. The reception was out of a storybook. 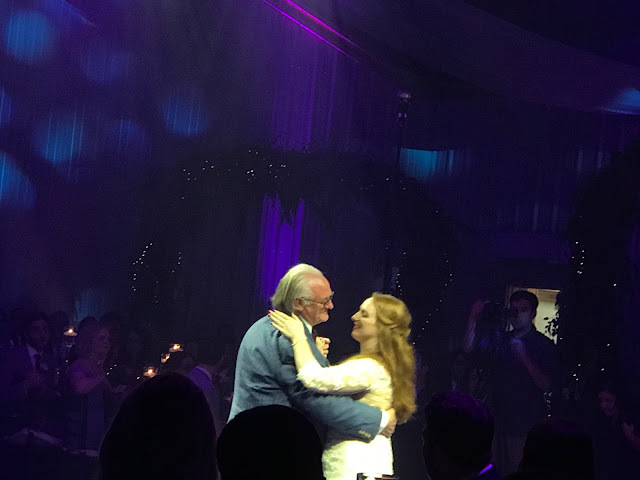 At the end of the father/daughter dance, a recording came over the speakers. It was a recording of the bride when she was an infant. She was talking to her father. In the context of this event, it was one of the most moving things I've ever heard. The recording of that conversation brought tears to the eyes of everyone in that room. I love weddings. For some reason, they give me hope. Hope is a fragile and precious thing. It sounds amazing'. I can't imagine a recorded conversation that was audible enough to use at such an event. That is great. Sounds like a BIGGy of events. Thanks for posting this. Something to think about. It sounds like a precious recording and so appropriate for the special occasion. I'm glad that you and Rick were part of the guests. Oops, I'm glad that you and Jilda were part of the guest. Ok, all weddings makes me cry whether live or on TV. l didn't know reading about one would!!!! In a world full of disposables, including marriages, I'm sure you are hoping this couple has as many wonderful years as you and Jilda have had...the good years and the tough ones. I hope they do too! Sounds like it was a really nice wedding! I agree with you Rick! It was a beautiful idea to include the recording. The links in the love chain are strong. My step daughter is in the process of planning her wedding sometime next spring...I am now not so fond of weddings, though I get what you are saying. Kids these days, OMG, money is not an object for anything and they all expect a story book affair, I almost has to end up a little disappointing somehow. I am thinking of taking up drinking heavy again, and I am just a step trying to keep my nose out of everything.